The posterior compartment of the leg contains seven muscles, organised into two layers – superficial and deep. The two layers are separated by a band of fascia. The posterior leg is the largest of the three compartments. Collectively, the muscles in this area plantarflex and invert the foot. They are innervated by the tibial nerve, a terminal branch of the sciatic nerve. 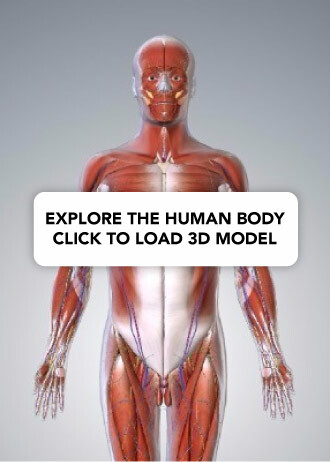 In this article, we shall look at the attachments, actions and innervation of the muscles in the posterior compartment of the leg. The superficial muscles form the characteristic ‘calf’ shape of the posterior leg. They all insert into the calcaneus of the foot (the heel bone), via the calcaneal tendon. The calcaneal reflex tests spinal roots S1-S2. Subcutaneous calcaneal bursa – lies between the skin and the calcaneal tendon. Deep bursa of the calcaneal tendon – lies between the tendon and the calcaneus. The gastrocnemius is the most superficial of all the muscles in the posterior leg. It has two heads – medial and lateral, which converge to form a single muscle belly. Attachments: The lateral head originates from the lateral femoral condyle, and medial head from the medial femoral condyle. The fibres converge, and form a single muscle belly. 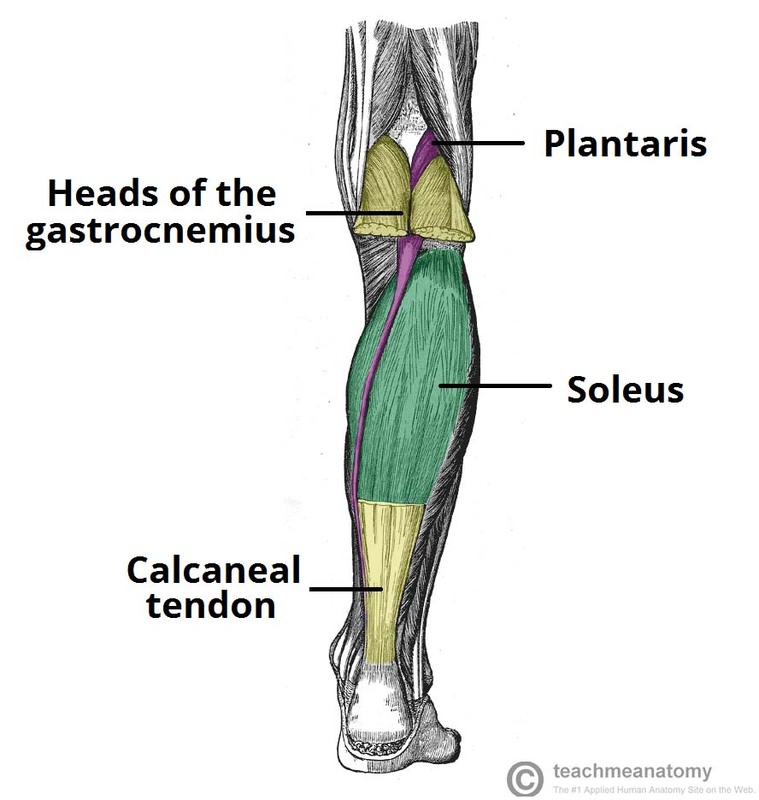 In the lower part of the leg, the muscle belly combines with the soleus to from the calcaneal tendon, with inserts onto the calcaneus (the heel bone). Actions: It plantarflexes at the ankle joint, and because it crosses the knee, it is a flexor there. Fig 1 – The muscles in the superficial layer of the posterior leg. The body of the gastrocnemius has been cut away to expose the underlying musculature. The plantaris is a small muscle with a long tendon, which can be mistaken for a nerve as it descends down the leg. It is absent in 10% of people. Attachments: Originates from the lateral supracondylar line of the femur. The muscle descends medially, condensing into a tendon that runs down the leg, between the gastrocnemius and soleus. The tendon blends with the calcaneal tendon. Actions: It plantarflexes at the ankle joint, and because it crosses the knee, it is a flexor there. It is not a vital muscle for these movements. The soleus is located deep to the gastrocnemius. It is large and flat, named soleus due to its resemblance of a sole – a flat fish. Attachments: Originates from the soleal line of the tibia and proximal fibular area. The muscle narrows in the lower part of the leg, and joins the calcaneal tendon. Actions: Plantarflexes the foot at the ankle joint. Rupture of the calcaneal tendon refers to a partial or complete tear of the tendon. It is more likely to occur in people with a history of calcaneal tendinitis (chronic inflammation of the tendon). The injury is usually sustained during forceful plantarflexion of the foot. The patient will be unable to plantarflex the foot against resistance, and the affected foot will be permanently dorsiflexed. The soleus and gastrocnemius can contract to form a lump in the calf region. Treatment of a ruptured calcaneal tendon is usually non-surgical, except in those with active lifestyles. There are four muscles in the deep compartment of the posterior leg. One muscle, the popliteus, acts only on the knee joint. 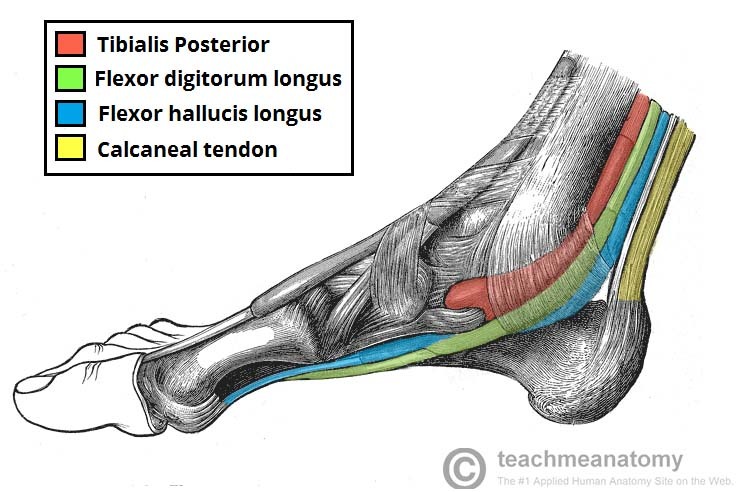 The remaining three muscles (tibialis posterior, flexor hallucis longus and flexor digitorum longus) act on the ankle and foot. Fig 2 – Muscles in the deep layer of the posterior leg. The popliteus is located superiorly in the leg. It lies behind the knee joint, forming the base of the popliteal fossa. There is a bursa (fluid filled sac) that lies between the popliteal tendon and the posterior surface of the knee joint. It is called the popliteus bursa. Attachments: Originates from the lateral condyle of the femur and the posterior horn of the lateral meniscus. From there, it runs inferomedially towards the tibia and inserts above the origin of the soleus muscle. Actions: Laterally rotates the femur on the tibia – ‘unlocking’ the knee joint so that flexion can occur. The tibialis posterior is the deepest out of the four muscles. It lies between the flexor digitorum longus and the flexor hallucis longus. Attachments: Originates from the interosseous membrane between the tibia and fibula, and posterior surfaces of the two bones. The tendon enters the foot posterior to the medial malleolus, and attaches to the plantar surfaces of the medial tarsal bones. Actions: Inverts and plantarflexes the foot, maintains the medial arch of the foot. 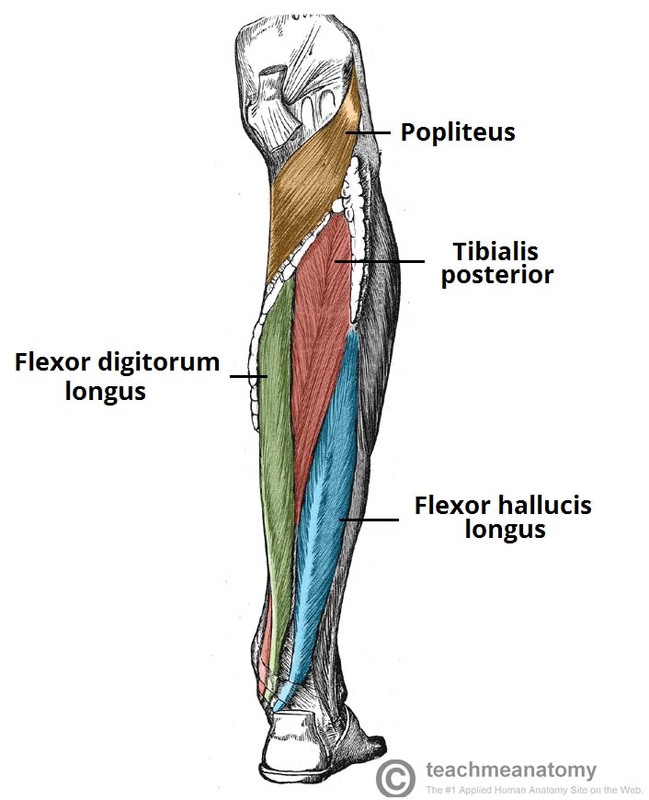 The FDL is (surprisingly) a smaller muscle than the flexor hallucis longus. It is located medially in the posterior leg. Attachments: Originates from the medial surface of the tibia, attaches to the plantar surfaces of the lateral four digits. Actions: Flexes the lateral four toes. The flexor hallucis longus muscle is found on the lateral side of leg. This is slightly counter-intuitive, as it is opposite the great toe, which it acts on. Attachments: Originates from the posterior surface of the fibula, attaches to the plantar surface of the phalanx of the great toe. Actions: Flexes the great toe. Fig 3 – Medial view of the tendons of the posterior leg. 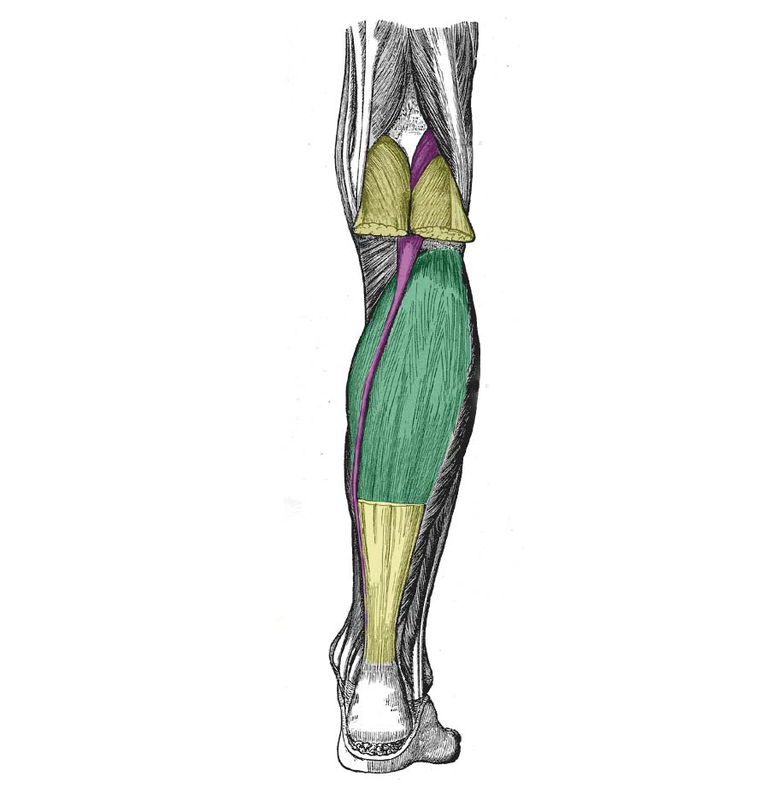 Below is an image of the posterior leg. Which muscle has been highlighted in green? Which of the following muscles flexes at the knee and plantarflexes at the ankle? In which direction does the femur move (relative to the tibia) to unlock the knee?